If there is anything I've learned in my sixty tears on this godsforsaken plane it's that you can never be too prepared. Sometimes all the spells and steel in the world won't pull your arse from the fire when a well-laid plan has gone belly up. What you need then is a good ritual to turn disaster into victory - or at least into something that doesn't resemble your own very messy demise. Good thing ol' Azagar is here to chisel a bit of the stupid off a world full of blockheads... I mean adventurers. 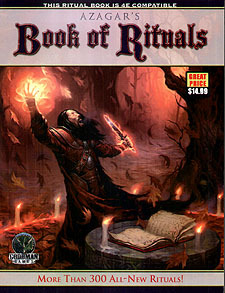 Azagar's Book of Rituals presents over 300 new rituals for Fourth Edition Dungeons and Dragons! Narrated by the hobgoblin general Azagar in his own inimitable style, Azagar's Book of Rituals features every category of rituals. It covers heroic, paragon, and epic play, and even includes rituals appropriate for the PHB2 bard and druid classes. An exhaustive set of indexes makes the book easy to navigate, and allows you to find rituals alphabetically, by level, or by category. Prepare yourself for hundreds of new ritual options for your character!